When I finish piecing something I always take a few days before starting the next project, just to let my brain settle down a bit. But hand quilting, I just keep right on, so the next quilt in the hoop is already backed, basted and ready to go. Having pushed it back down the queue (so that I didn't end up doing 3 circle quilts in a row) it is Quiet Quilt's turn. A look back tells me it has been waiting since 14th December 2015. I am trying out a new thread for this: Auriful lana, which is 50% wool, 50% acrylic and comes in some lovely colours. I have a couple of neutral shades but thought I'd give this a go first. Although I wondered if such a definite shade might be a bit much, I actually rather like how it looks, so will keep going for now. Linking up with Slow Sunday Stitching. I'm loving the look of this colour thread too! 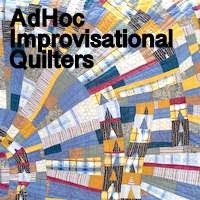 I like the contrast that this thread has with your quilt. I have not seen that type of thread before. I really like your thread choice. That gold thread looks gorgeous woven through your quilt like that! I must look for some of this thread. I wonder how it will work in the machine? Great choice! Love the gold color accenting your quilt! Oh, I love how the color is adding to the quilt. I'll be interested to hear what you think of the lana once you have used it for a while. Oh my do you know how to make GORGEOUS quilts. I love the squares and different sizes of strips. I LOVE the thread. You just ROCK! It's amazing how orange and blue compliment one another. I sew slowly also! Qi have some of this wool thread and have used it in my machine with no problems. Love the color it is adding to your quilt. Enjoy working with this yummy thread colour! Your quilting looks great. I would have never picked gold to put on a gray quilt but I really like how it's turning out. Live and learn. . .
Great hand quilting, Kaja, and color choice. I do love any kind of orange! I didn't know that Aurifil did a wool/acrylic thread, I love the colour you've gone with here. I'm constantly amazed how thread color varies from spool to quilt as well as between machine and hand quilting. On the spool, this looks too dark and bright for your quilt, but after hand quilting it is the perfect spark. Great choice. Thanks for showing us. I really like the way that orange thread looks. What size needed do you have to use with that thread? Is it 12wt.? Beautiful! May I ask the color name and number? Also, thread weight? Thanks! That looks great Kaja - the colour really works.